RTTY has a relative large bandwidth (about 250 Hz for RTTY at 45 Bd and 170 Hz shift) and needs a SNR of about -5 dB (at 2.5 kHz bandwidth). For comparison, the threshold level of JT9 is about -27 dB. PSK31 has a more acceptable bandwidth (60 Hz) but the threshold level is 'only' about -10 dB. In addition it requires a linear amplifier and thus is not suited to be used in combination with a high efficiency class D or E PA. This limitations led to the development of some new digital modes, specific for LF and MF. Jason is a weak signal communication mode developed in 2002 by Alberto di Bene, I2PHD, and Vittorio De Tomasi, IK2CZL. It was especially tailored for LF work. The basic idea is that MFSK is a rather efficient digital modulation, but at slow data rates frequency stability can become an issue. So instead of using the absolute frequency of the tones Jason is using Incremental Frequency Keying (IFK), where the frequency difference (shift) between 2 subsequent tones is used. This allows much more flexibilty for both frequency accuracy as frequency stability. Furthermore IFK is less vulnerable to multi path interference and inter-symbol interference caused by multi path propagation than MFSK. The default center frequency of Jason is 800 Hz, with a total range from 797.981 Hz (800 Hz - 8 steps) to 802.019 Hz (800 Hz + 8 steps). The default center frequency is slot number 8, the slots are numbered from 0 to 16 (17 slots in total). 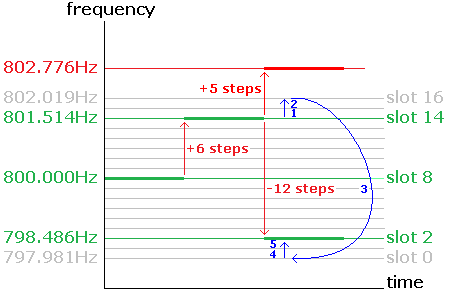 Assume we start at 800 Hz (center frequency) and the first shift is 6 steps (1.514 Hz). Now the frequency is 801.514 Hz, corresponding to slot 14 (8+6). The second shift is 5 steps (1.262 Hz), resulting in a frequency of 802.776Hz. Note that the slot number would be now 14+5 = 19, which is greater than the maximum slot number 16. So the 5 steps are split up in 2 steps upward (to slot 16), the 3rd step is the 'roll over' to slot 0 and finally the 4rd / 5th step are again 2 steps upward to slot 2. The result is a negative shift of 12 steps (3.028 Hz) but Jason knows that this has to be interpreted as a positive shift of 5 steps. More mathematical: if the upper limit is exceeded the correct slot number is computed modulus 17. In this case, instead of shifting to the non-existing slot 19 the shift goes to slot 19-17 = 2, corresponding to a frequency of 797.981 + 2 * 0.25234 = 798.468 Hz. The total bandwidth of a Jason signal less than 5 Hz. Due to the use of IFK the frequency stability requirements are rather relaxed. The frequency drift over a 10 minute period should be less than 5 Hz what equals to about 10 ppm at 472 kHz. In addition Jason has a kind of Automatic Frequency Control (AFC) built in, giving a lock range of 12 Hz. The above refers 'normal speed' modus of Jason, where the duration of each tone is 11.85 seconds. Since each character needs 2 tones the transmission speed is roughly 2.5 characters per minute and the sensitivity is about -25 dB (again at 2.5 kHz bandwidth). In 'fast speed' modus the throughput is 20 characters per minute, at the cost of a larger bandwidth (32 Hz) and a reduced sensitivity. More information about Jason can be found in the Jason Technotes. In 2013 Con Wassilieff, ZL2AFP, and Murray Greenman, ZL1BPU introduced another real time weak signal mode named WSQ (Weak Signal QSO). In 2017 it was replaced by a improved version and renamed to WSQCal. As Jason, WSQCall uses Incremental Frequency Keying (IFK) but with 33 tones each spaced 1.46 Hz apart, resulting in a signal bandwidth of 48 Hz. Each tone takes 2.048 seconds. In combination with a character compression technique (based on varicode) WSQCall can achieve speeds up to 25 characters per minute, what allows to complete a short QSO within a few minutes. Varicode was developed by Peter Martinez, G3PLX, to be used in PSK31. The basic idea is that commonly used characters ('space', E, T, ...) are sent in fewer bits than those less often used (J, Q, Z, ...). This is a practice also used in morse. ZL1BPU adapted the varicode to be used in 33 tone FSK. WSQCall has a remarkable sensitivity of about -25 dB (at 2.5 kHz). This is due to the fact that each tone is decoded separately with a narrow bandwidth (0.5 Hz) and integrated over 2 seconds. For backward compability with WSQ a tone spacing of 1.95 Hz can also be selected. 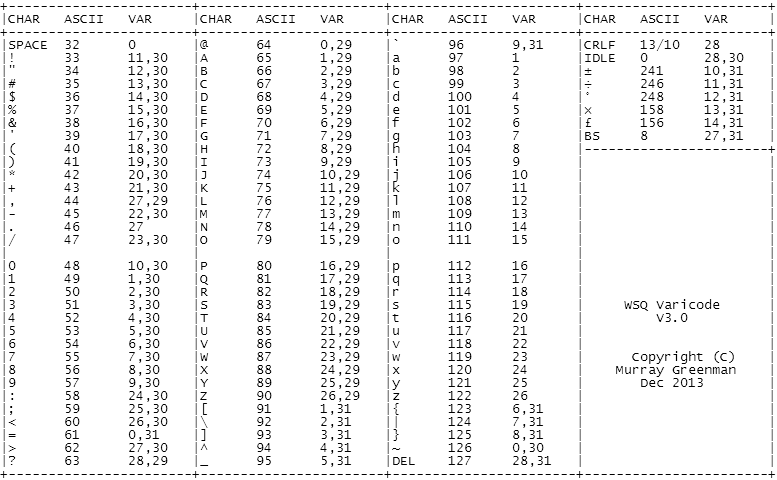 Besides the default speed of 0.512 Baud (what equals about 5.5 WPM) also speeds of 1.024 Bd (11 WPM) or 0.256 Bd (2.7 WPM) can be set. More information about WSQCall can be found in the article A Weak Signal QSO mode for LF/MF. There is nothing new under the sun. André, N4ICK, sent me a copy of an article that was published in RCA review of March 1966, titled 'Low-power long-range digital communications system'. The TX was swept over a 20 Hz range every 20 seconds, to ensure that it would cross the RX passband even if the TX drifted ± 10 Hz away. The RX had 3 sets of passband filters, each 17 Hz apart. This allowed receptions even at a drift up to ± 30 Hz. The disadvantage of all this measures is that the bite rate was reduced to 3 bits per minute. As 5 bit characters were used the data rate was 0.6 characters per minute. The block diagram of the RX is given at the left. It is based on a commercial receiver with a 500 kHz IF output. This IF was converted to 20 kHz and then filtered using a set of 6 crystal filters in the range of 19981 Hz to 20017 Hz. At the right you can see the 100 mW portable transmitter. As mentioned before the main problem was achieving the required frequency stability. This was done by keeping the crystal oscillator at a constant temperature ... using the human body as thermostat. The crystal oscillator was put in a small metal box (in the red ellipse), connected to the TX via a couple of wires. To keep the temperature stable the operator had to keep the oscillator in his armpit! The tests showed that this way the SNR could be improved by about 40 dB compared to conventional communication.